In 1990, the Manchester indie music scene was making its mark, The Happy Mondays, The Stone Roses, The Charlatans and the Inspiral Carpets, among many others, had all recently broke into the UK singles chart and were becoming a force to be reckoned with. The Haçienda nightclub played a major part as it was probably the catalyst for the explosion. Another couple of bands at the time, who I’d heard and assumed, wrongly, they were Mancunian, because of their sound, were EMF (actually from Gloucester) and Flowered Up (from London). Flowered up were formed in 1989 in London’s Camden Town by the Maher brothers, Liam and Joe and included their school friends Andy Jackson and John Tuvey as well as keyboard player Tim Dorney. They also occasionally included a dancer known as Barry Mooncult who was not officially a member, but was a live attraction. Terry Mcquaid, a former drum roadie for The Clash, became their manager and with his connections, managed to get the Clash’s drummer, Topper Headon, to play on Flowered Up’s debut hit single, It’s On. 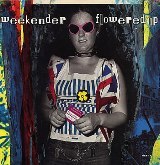 Weekender was basically about a weekend-long rave, a manic time for 48-hour party people. It has a powerful rock-type beat with a few percussion breaks, a guitar solo, some horns used to great effect and a haunting oboe in the middle. Everyone involved with it at the time had faith in it and Flowered Up decided to have an unofficial launch party for it. They decided to name it Debauchery and instead of hiring a London nightclub or a warehouse, they decided to use a mansion in a posh south London suburb. Mooncult was fitting some double glazing at the house which belonged to a race-horse owner who apparently had received a letter from the taxman and decided to flee the country immediately. Mooncult, who still had a set of keys, thought it would be a good idea to hold the party there. On the night in question, the first floor became a nightclub complete with dancefloor and lights and the two DJs were Terry Farley and Paul Oakenfold. The party lasted a couple of days and among the 1000 people who turned up were members of the Happy Mondays, Primal Scream as well as Kirsty MacColl, Kylie Minogue and one member of the Guildford Four. At one point the police were called due to noise levels, but Flowered Up’s security men on the door refused to let them in. The record sleeve for Weekender has a photo of Sid Vicious’ hotel room the morning after he’d killed Nancy Spungen and the accompanying video is more like a short film with the opening scene showing Liam initially laying down (the shot taken looking down at the street) and then standing up in a window cleaner’s cradle scaling the heights of London’s Centre point. Their one and only album, A Life With Brian wasn’t well received, it reached number 23 on the chart, but after only three weeks it was gone. By 1993 most of the band were experimenting with heroin and thus came the downfall. “We had just signed to Columbia records,” Liam recalled, “but we were just getting into heroin and there were fights with one of our managers about where our money was going. I lost my house and we all ended up skint. I spent the next five year fighting my addiction and in 2000 I got a call from Alan McGee telling me he was interested in signing me to his Poptones label if I could stay off the drugs.” He teamed up with Tim but Alan didn’t like what they were doing so the deal never happened. Joe began getting into trouble regularly with the law for offences like theft and breach of bail. In an interview in 2001 he said, “I’ve been in and out of jail since 1994 and the heroin cost me my relationship, my house and my career. Watching my brother Liam get clean has been a massive inspiration and I’ve just started playing guitar again.” Tim was the only one didn’t touch the drugs and thus continued in the music business when he joined the original line-up of Republica in 1996. Andy Jackson, did less drugs than most of the members and went on to form a new band called Stadia, but without success he quit and was last known to be working in a hotel in Islington. As for John, after he got clean he became a meat delivery van driver. Unfortunately neither of the Maher brothers stayed clean. Both had got back into drugs and both sadly passed away from drug overdoses, Liam in October 2009 and Joe in November 2012. Both were in their early forties.